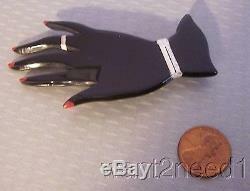 Vtg French BLACK CARVED PAINTED PLASTIC HAND PIN silver ring red fingernails! 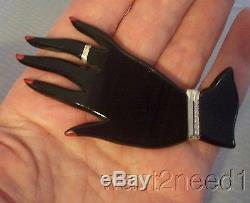 This is a fabulous vintage French black plastic figural hand pin with handpainted red fingernails. There is a silver ring around finger and a silver bangle at wrist of this graceful hand. Measures 3-1/4 long and has heat-set metal pinback with French trombone clasp. I GUARANTEE ALL MY MERCHANDISE IS ALWAYS 100% AUTHENTIC. Please consider pictures as part of description. If you have not worn, used or in any way altered an item, you may return for any reason. New listings almost every day, with a wide selection of merchandise from around the world. I carry items from the ancient to brand new; from the very fine to fabulously funky; lots of gorgeous jewelry from platinum to plastic; and always the unexpected. More than just a pretty picture. 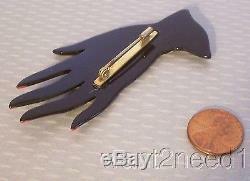 The item "Vtg French BLACK CARVED PAINTED PLASTIC HAND PIN figural lady's red fingernails" is in sale since Sunday, August 26, 2018. This item is in the category "Jewelry & Watches\Vintage & Antique Jewelry\Costume\Bakelite, Vintage Plastics\Pins, Brooches"." and is located in Royal Oak, MI.